NASA recently celebrated 15 years of continuous habitation on the International Space Station. During this time, the ISS and other satellites brought us an inestimable trove of information, pushing forth our understanding of the planet by a wide margin. Let’s have a look at some of these accomplishments. The minimum concentration of ozone above Antarctica from 1979 to 2013. 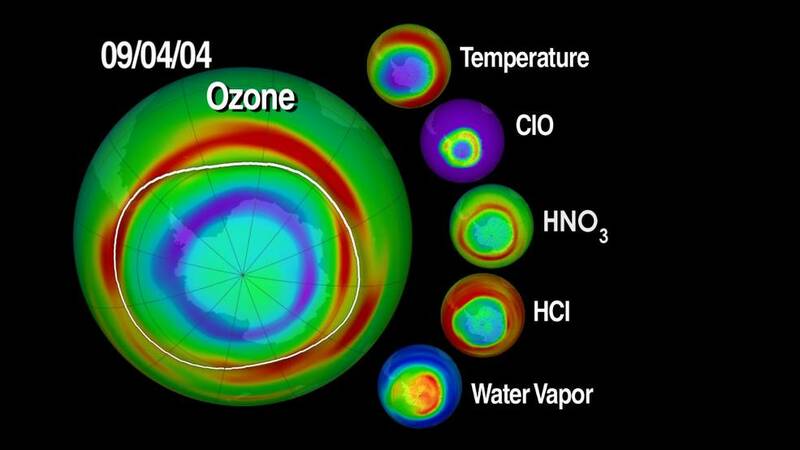 The 1987 Montreal Protocol banned the use of ozone-depleting chemicals and the entire world joined efforts to tackle a major threat. The ozone layer, high in the atmosphere, acts like sunscreen for Earth, protecting every living thing on the surface from the sun’s harmful radiation. If a glacier collapses and no one sees it, does it actually collapse? Yes, because NASA sees it. In January 2002, the surface of the Larsen B Ice Shelf – a mass of ice measuring 1,250 square miles, larger than New Hampshire and Vermont combined became quickly covered by ponds, and in mid February, it started collapsing. The collapse wasn’t complete until March 7. At the start of the 21st century, we already had a pretty good idea about the vegetation cycles, but satellite views allowed us to measure carbon absorption due to vegetation; here, the darker green shows higher rates of carbon absorption, somewhat mimicking the seasonal growth and decline of green vegetation across the planet. It may surprise you, but the air quality in the US has improved in recent years. Mostly due to stricter regulations for cars and industries, US citizens are breathing cleaner air. Here, NASA monitored one pollutant – nitrogen dioxide – using the OMI instrument on the Aura satellite. The timeframe is 2005-2011. Sadly, not all news from outer space is that good. Each year, a whopping one third of the land surface is touched by at least one fire. Since they started recording, NASA’s satellites have recorded over 40 million actively burning fires, revolutionizing scientists’ understanding of where fires occur and how they affect ecosystems, as well as the carbon dioxide released in the atmosphere. The real-time fire map has proven an extraordinary resource. 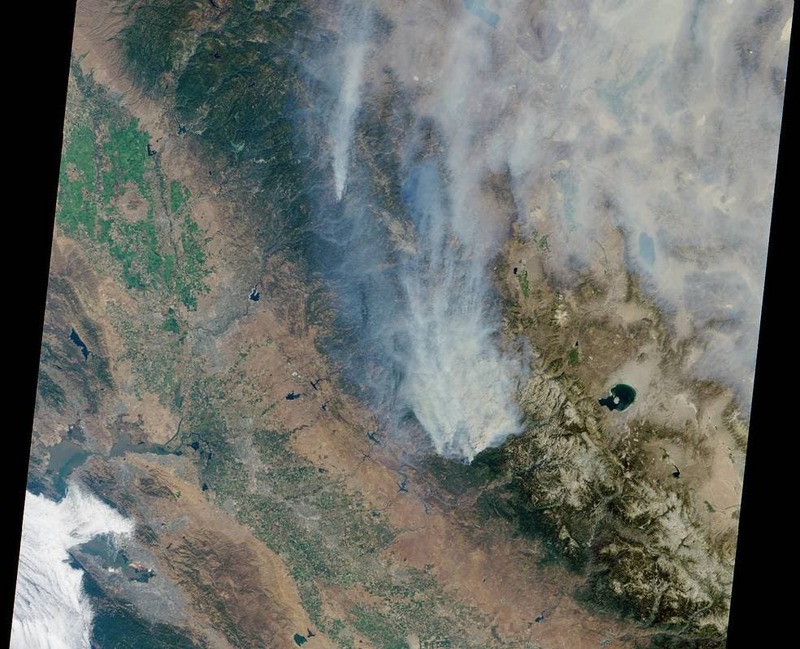 Smoke plume from California’s Rim Fire, Aug. 23, 2013. Their sensors can detect not only the heat given up by wildfires, but also count the number of active fires around the globe at any given time by studying smoke plumes. The image shows change in sea ice and solar absorption in the summer months in the Arctic between 2000 and 2014. Blue shows where sea ice has decreased, and red shows where solar radiation absorption has increased over the last 15 years. The Arctic is possibly the most important area in terms of climate – because it is covered in snow, it reflects most of the solar energy. If the ice melts, it will become darker, and absorb even more heat from the sun, and melt even more, creating an anti-snowball effect. Warming is also much more pronounced in the Arctic. Along the years, several satellites have monitored the extent of Arctic ice, but the Aqua satellite was the first one that us such high-resolution data that we could see how something like the Arctic ice cap – a floating layer of sea ice larger than the continental U.S. – moves and changes on a daily basis, and shrinks and grows seasonally. Average yearly AIRS CO2 data shown in yellow is laid over MODIS vegetation data in green. CO2 accumulates in the Northern Hemisphere winter and spring, then the vegetation’s photosynthesis absorbs it in summer. The AIRS – Atmospheric Infrared Sounder – instrument on Aqua measured carbon dioxide a few thousand feet above the surface. Most notably, this visualization allowed us to see just how the greenhouse gases is distributed in the planet’s atmosphere during the seasons. 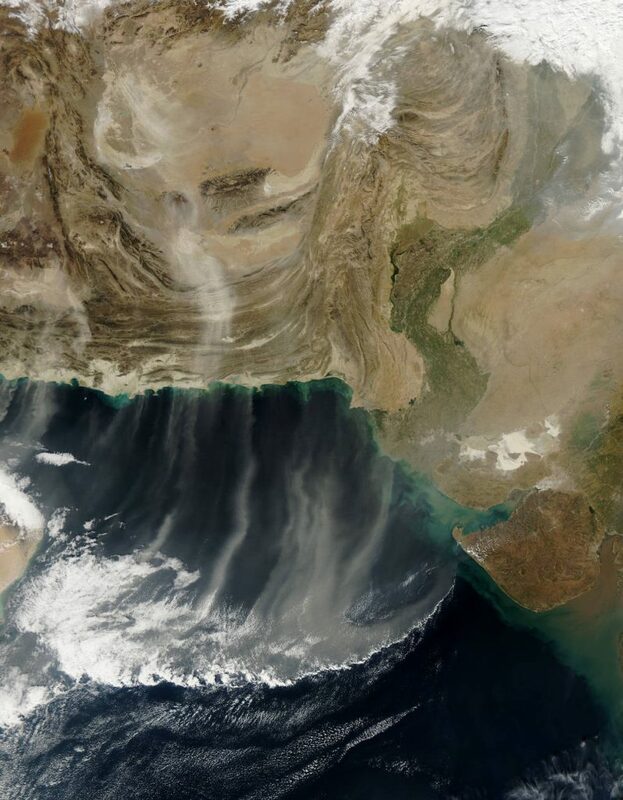 Dust plumes from Iran, Afghanistan and Pakistan blow southward over the Arabian Sea, Dec. 28, 2012. Clouds and aerosols are two of the still-mysterious variables when it comes to the future of climate change, creating more uncertainty. Some clouds reflect the sun’s rays, while others capture the heat, and the same can be said about aerosols. Aerosols can also seed clouds, further complicating the picture. NASA and Japan’s Ministry of Economy, Trade and industry (METI) released the Global Digital Elevation Model to the public on June 29, 2009. Explorers have went to all corners of the world, charting inhospitable areas and tropical paradises just as well, but now, we can create topographic maps from outer space. 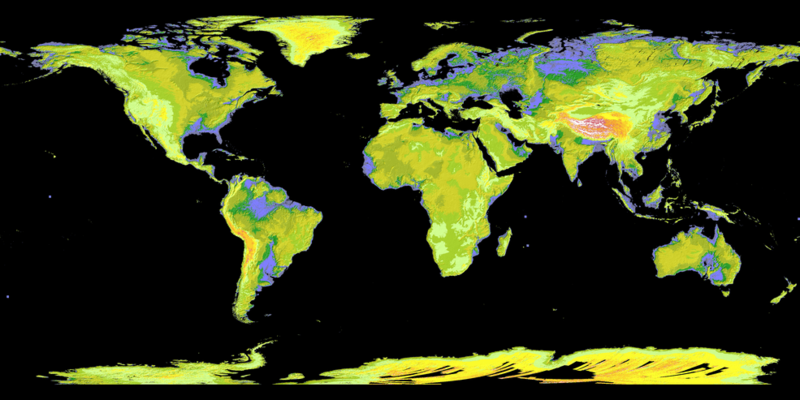 The Global Digital Elevation Models produced by the Advanced Spaceborne Thermal Emission and Reflection Radiometer, or ASTER, instrument aboard Terra collects pairs of slightly offset images of Earth’s surface. The image pairs work like our eyes – the slightly offset images give information about depth and allow scientists to visualize the Earth’s terrain in 3D. The image above was stitched from over 1.3 million scenes. 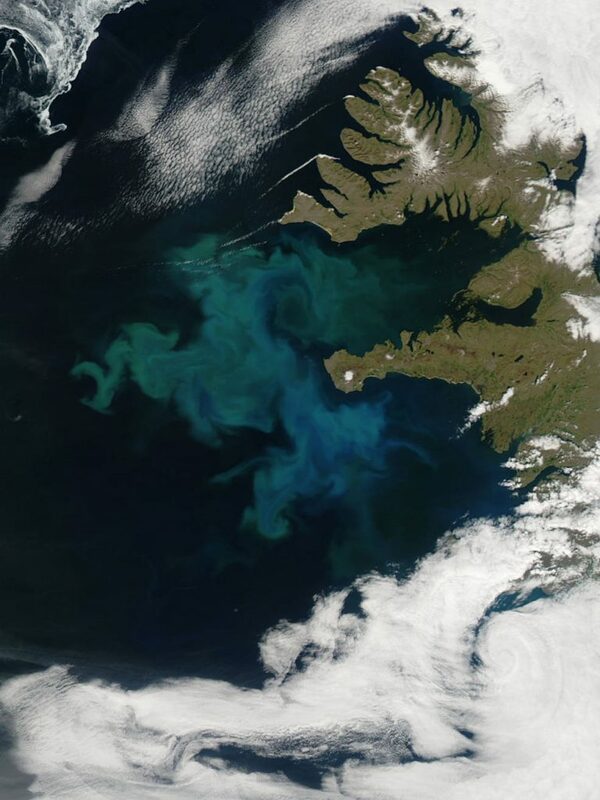 North Atlantic phytoplankton bloom off the coast of Iceland, June 24, 2010. Plankton may be tiny, but when they gather together… they reach incredible sizes. Plankton blooms can cover hundreds of miles. Globally, phytoplankton blooms account for about half of the net photosynthesis on Earth and are major players in taking carbon out of the atmosphere and transferring it to the ocean. MOPITT’s monthly average of global concentrations of tropospheric carbon monoxide at an altitude of about 12,000 feet, in April 2000 (left) and April 2014. Carbon monoxide is a colorless, odorless pollutant, emerging from everything from forest fires to vehicle tailpipes… so how do you map it? An instrument on Terra called Measurements of Pollutants in the Troposphere, or MOPITT, was the first dedicated to tracking sources of carbon monoxide and following the gas across the globe. The good news is that while the carbon dioxide in the atmosphere has increase, carbon monoxide has actually decreased. 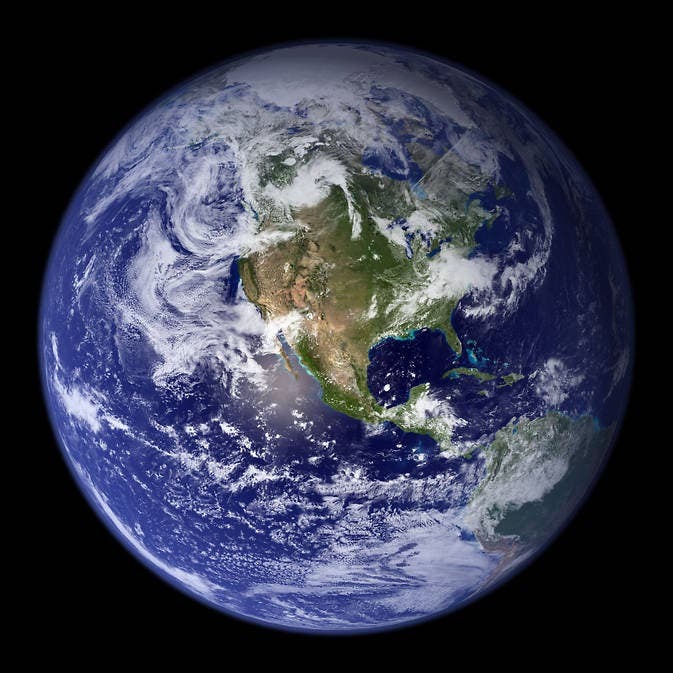 The western hemisphere of the Blue Marble, created in 2002. The Blue Marble image has become one of the most iconic ones in the modern history of mankind. In 2002, NASA scientists and visualizers stitched together strips of brand new data, in natural color, collected over four months from the Moderate Resolution Imaging Spectroradiometer, or MODIS, instrument aboard Terra. They added a layer of clouds to create this composite Blue Marble, for everyone to admire.